Claire Danvers is a freshman at college in Morganville, Texas. It’s an unprestigious college in equally unprestgious small college town. Clever and geeky, Claire never expected to fit in with the in-crowd of fashionable and popular girls but when she inadvertently makes an enemy of the clique’s leader Monica, she had no idea how bad things would get. Unable to stay in the dorm, Claire looks for off-campus accommodation and answers an advert in the paper for a room-to-let in a creepy old shared house. Accepted into the house, she finally feels like she is making some real friends, even if they are a little odd. Firstly, there is Michael the owner of the house, he’s only eighteen and a complete night owl. In fact, nobody has ever seen him during the day. Ever. Eve, a Goth girl who works at the local coffee shop and is a fellow roommate in the Glass House swears that Michael’s okay and is not a vampire and she would know because she’s checked…. Although, she also claims that Morganville is a town run by vampires, so she could just be crazy. Finally, there is Shane. He’s eighteen and although he doesn’t seem to do anything much all day apart from make chilli and kill zombies whilst playing computer games, Claire thinks he’s totally cool. Her new roommates are the best thing about living in Morganville because, as it turns out, Eve isn’t crazy and the town is run by vampires. In Morganville you have two choices - you either work for the vampires and have their protection or you are fair game. When Monica says she’s going to see Claire dead, she really means it. Luckily Claire’s new friends have her back and they hatch a plan to deal with the vampires and help her stay alive. 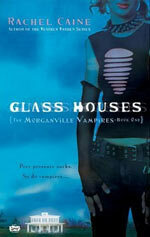 Glass Houses is book one of The Morganville Vampires series written by fantasy and romance author Rachel Caine. Whilst Glass Houses is a book aimed at the Young Adult market it is a book that can be enjoyed by adults too. Morganville, the town where the book is set, has a bit of a Lost Boys vibe. There are a lot of strange disappearances and nobody dares step out of line or speak up, apart from the rebellious teenage residents of the Glass House. There are vampires and their flunkies everywhere and knowing who you can trust is a real problem. Glass Houses ends with a major cliff hanger ending which I usually find annoying in a book, but the quality of the story means that I am looking forward to reading the next instalment in this series so I don’t begrudge the thought of having to buy another book about the Morganville Vampires to find out how this one ends. 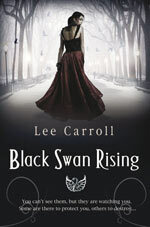 If you are an adult reading this review and are tempted to get the book but think that you really can’t bear to buy a book for written for the Young Adult market, buy it anyway, read it and then give it to your teenage sister, cousin or children and pretend that you bought it for them all along. This approach always works for me. Rachel Caine's website has information about all her novels and a link to her blog. Check out Rachel's site.